On September 28, 1953, Bonnie Brown Heady walked into the Notre Dame de Sion, a Catholic school located in Hyde Park, and told school officials that she was the aunt of Bobby Greenlease, a six year old enrolled in the school. Heady claimed that Bobby’s mother had suffered a heart attack that morning so that a nun would release the boy into Heady’s custody. Heady thus managed to kidnap the boy without arousing any suspicion among the school staff. 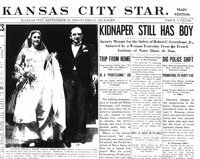 Within hours of the kidnapping, Heady’s accomplice and lover, Carl Austin Hall, murdered Bobby in Overland Park, Kansas. Hall then informed the Greenlease family that Bobby was still alive and demanded a ransom of $600,000, the largest amount in U.S. history at the time. Robert Greenlease, a wealthy Cadillac dealer in Kansas City, complied with the demand a week later, but he first asked Arthur Eisenhower, local banker and brother of President Dwight Eisenhower, to record the serial numbers from each of the 40,000 ten and twenty dollar bills. With the money in hand, Hall and Heady fled to St. Louis, where Hall dumped Heady without giving her a share of the money. Hall was later arrested by St. Louis policeman Louis Shoulders, who had connections with the gangster Joe Costello. Shoulders’s mob connections became a point of media fixation when investigators only recovered half of the ransom money. Had Costello, owner of the cab company which transported Hall around St. Louis, tipped off Shoulders in exchange for a cut of the money? The fate of the ransom money remained a mystery that made headlines for years whenever one of bills with the missing serial numbers turned up. Unfortunately, Bobby Greanlease’s fate was not a mystery. On October 7, 1953, police uncovered the boy’s body in a flower bed at Bonnie Heady’s home in St. Joseph, Missouri. Bonnie Heady and Carl Hall pleaded guilty, declined to appeal the death sentence, and were executed in a gas chamber on December 18, 1953. Of the many notorious kidnappings in the mid-twentieth century, the crime is remembered for the kidnappers’ appalling disregard for the child’s life and the mystery surrounding the fate of the ransom money. Read a biographical sketch of the Greenlease family, prepared by Susan Jezak Ford, Missouri Valley Special Collections. A Grave for Bobby: The Greenlease Slaying, by James Deakin; argues that officer Louis Shoulders did indeed make a deal with the mob involving the ransom money. Federal Justice in Western Missouri: The Judges, the Cases, the Times, by Lawrence H. Larsen; contains a brief synopsis of the Greenlease kidnapping and trial, pp. 221-223. Research the Notre Dame de Sion school using Local Catholic Schools Collection, Missouri Valley Special Collections. James Deakin, A Grave for Bobby: The Greenlease Slaying, (New York: William Morrow & Company, 1990). Dory DeAngelo, What About Kansas City! : A Historical Handbook, (Kansas City, MO: Two Lane Press, 1995), 94-95. Susan Jezak Ford, “Greenlease Family,” Missouri Valley Special Collections: Biography, 2003. Henry R. Luce, “The News that Shocked a Nation,” Life 35 (October 19, 1953): 33-37. Rick Montgomery & Shirl Kasper, Kansas City: An American Story (Kansas City, MO: Kansas City Star Books, 1999), 278. “The Best the Law Provides,” Life 35 (November 30, 1953): 30-31. “Where’s Bobby?,” Newsweek 42 (October 12, 1953): 27.